Oats are a good grain alternative for those looking to cut excess carbs. Use a food processor to process 2 cups of certified gluten free oats into oat flour. Depending on the size of your grinder, you may have to do this in batches. Place oat flour, baking powder, baking soda, brown sugar and cinnamon in a mixing bowl. Whisk to blend. Lightly beat eggs in a small bowl. Add yogurt, apple juice, oil and vanilla. Whisk to blend and pour into bowl with dry ingredients. Stir to thoroughly blend. Fold in shredded apple and walnuts. Stir just until blended. Line muffin pan with paper liners, or lightly grease pan and fill each muffin cup about 3/4 full. 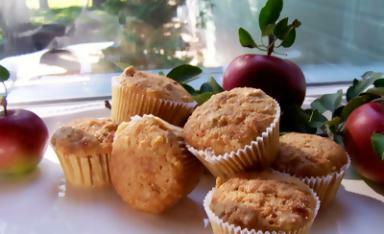 Bake for 16 minutes or until a toothpick inserted in the center of muffin comes out clean. Sprinkle hot muffins with cinnamon sugar mixture and allow muffins to cool for about 10-15 minutes before serving.